The SportTACH is designed specifically for the watercraft and snowmobile power sports market and is fully water tight. Its advanced design includes a large, easy to read LCD display and connections for up to three EGT probes. 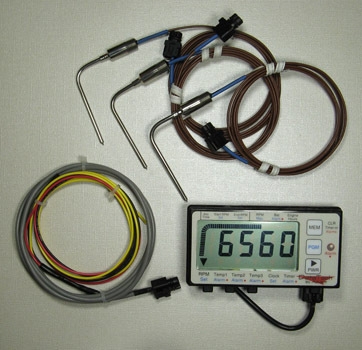 The EGT probes can be used to measure cylinder exhaust temperature up to 1600º F, or water and air temperature from 32ºF. The SportTACH has many unique features including time-of-day clock, trip timer and total engine hour timer. Settable alarms are provided to warn you when EGTs go out of range, or vehicle battery is low. Data logging memory records maximum values such as RPM and EGT temperatures from the last six runs. The data of each run is time-of-day stamped so you know which data is related to each run. Yamaha GP1200V and GP1300R plus the Kawasaki 1100ZXi, 1100STX, 1200STX racing ignitions have been designed for GP class racing. These new ignitions provide significant performance gains over the stock ignitions. Each of these 3-cylinder ignitions produce 4 to 5 times the spark energy of the stock ignition and holds up to 4 timing curves, fully user settable Rev Limiter and now feature the remote curve selection switch option. 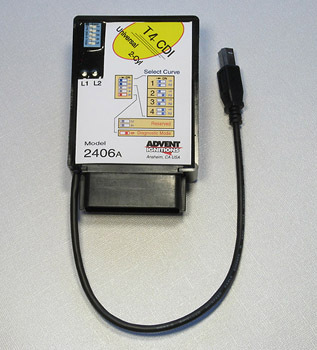 This next generation of ignitions are completely user programmable with the PC based Curve Devil® software. The T4 is state-of-the-art in both capabilities and the use of advanced circuit design providing high energy spark with hours of battery life when used in total loss mode. This feature rich ignition provides 3 external relay controls, three Rev limiters (Starting line, Single stage or dual REV limiter) plus the T4 holds up to 4 timing curves. Several analog engine sensor inputs are included to improve engine performance. The T4 ignition works with most 1 – 2 cylinder, 2-stroke engines.